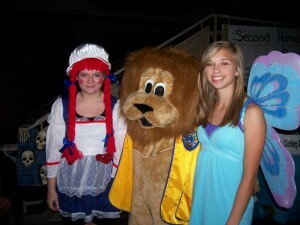 After the Farragut Lions’ Freaky Friday on October 30, I had a few hours to rest up before the West Side Leo Club (at Hardin Valley Academy) held a costume dance. They had a terrific turn-out of Leo members, as you can see from the photo, and many, many students! Hmmm. . . I didn’t realize I was looking down in that group photo. I guess that’s a new challenge for dealing with this big head! 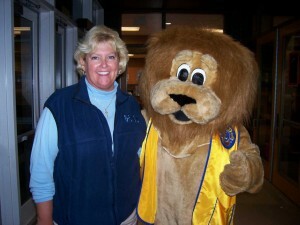 It was nice to meet the Leo Club Advisor and one of the school administrators. I can’t remember the administrator’s name, but she told me her son had been the University of Tennessee mascot a few years before. So she understood the temperature challenges and was nice enough to offer me a place to rest if needed. 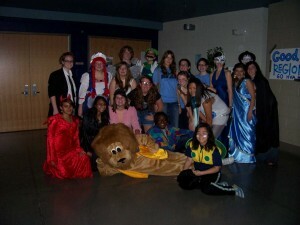 The Leos did a terrific job setting up and decorating for the dance. They also stayed pretty busy throughout the evening with handling admissions, refreshments, and activities! A couple took a break from working to have a picture taken with me. Great costumes! When I wandered back toward the dance area, several of the students wanted to know who I was. . . expecting I was a fellow student. I decided “better safe than sorry” and left the partying to the students once the dance got moving in full gear. Congratulations to the West Side Leos for a successful event! Hopefully, I’ll have the chance to work with the Leos again! I’ve got larger versions of the photos in my photo album.